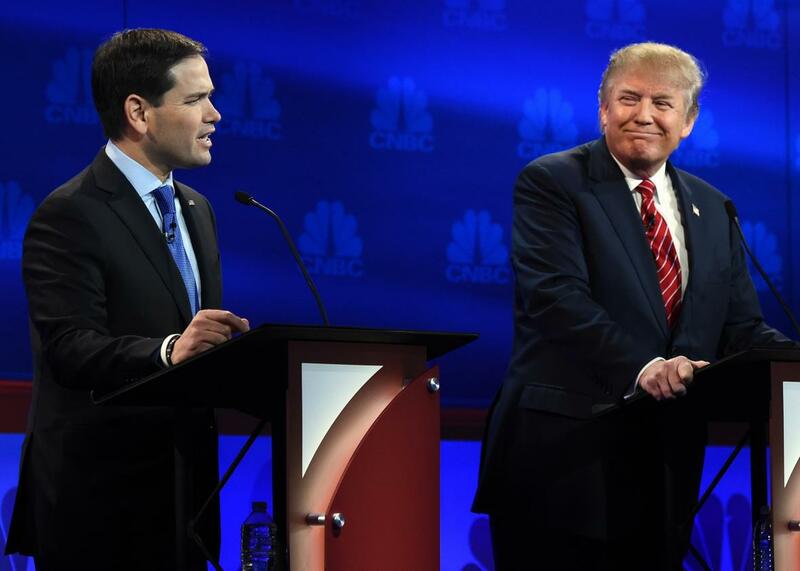 Marco Rubio won CNBC's Republican debate. Marco Rubio speaks as Donald Trump looks on during the CNBC Republican Presidential Debate on Oct. 28, 2015 at the Coors Event Center at the University of Colorado in Boulder. Marco Rubio was strong but not quite spectacular during the first two Republican debates, picking up some fans but largely failing to stand out on a stage dominated by Donald Trump. On Wednesday, though, the freshman senator finally lived up to his billing as the candidate who could sell his party’s more conventional views to its anti-establishment base. Rubio was polished and poised in Colorado, delivering a superior performance that included well-timed one-liners and powerful counterattacks. As important for Rubio, though, was that his biggest rival in the establishment lane—Jeb Bush—failed to turn in the type of performance that would soothe the fears of his nervous-and-getting-more-so backers inside the Republican Party. It was clear early that Rubio came ready to fight. When CNBC’s John Harwood pressed him to respond to a newspaper in his home state, the Sun-Sentinel, calling on him to resign his Senate seat while he seeks the presidency over his history of missed votes, Rubio ticked off the percentage of votes Barack Obama and John Kerry missed when they were running for president and called media bias. “This is another example of the double standard that exists in this country between the mainstream media and the conservatives,” Rubio shot back. The partisan crowd went wild. Later, when CNBC’s Becky Quick pressed Rubio about whether his past personal bookkeeping problems suggest he doesn’t have the “maturity and wisdom” to be president, Rubio played the “think-of-the-children” card to great affect. “My four children received a good Christian education and I’ve been able to save for them to go to college so they never have to have the loans that I did,” he said. “I’m not worried about my finances, I’m worried about the finances of everyday Americans who struggle in the economy that is not making good jobs.” When the moderator continued to press, Rubio spun it into an attack on the Democratic front-runner. “I know for a fact how difficult it is to raise children and how expensive it is for working families,” he said. “We can’t afford another four years of that. Which is what we will get if we elect a big-government liberal like Hillary Clinton to the White House.” It was somewhere between a nonanswer and a non sequitur, but it landed in the room. Rubio wasn’t the only Republican to have his moments on the Boulder stage, though. Ted Cruz delivered a mainstream-media–bashing master class that would have made Newt Gingrich proud. (The questions Cruz attacked were totally reasonable, but him attacking them polled through the roof with GOP focus groups.) Donald Trump and Ben Carson, meanwhile, stuck to the scripts that have taken them to the top of the GOP polls: The former was his usual blustery self, while the latter managed to hide in plain sight while giving calm and confident answers. Carly Fiorina and Chris Christie proved yet again that they know how to work a room and a camera. And when the CNBC moderators begged John Kasich to play the role of the adult at the table, the popular Ohio governor did his best to deliver. (Calling Trump and Carson crazy might not endear him to his party’s base, but he may have won the hearts of more moderate Republicans who have tired of the Trump show.) But even if Rubio didn’t win the debate in a knockout, given his performance—and Jeb’s—it was Marco who was the night’s biggest winner.